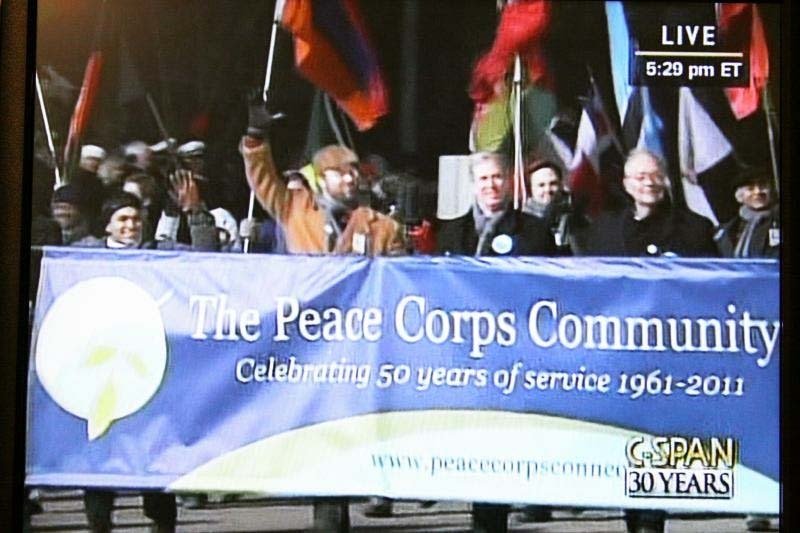 Organized by the National Peace Corps Association and the Washington DC Returned Volunteers, members of the Peace Corps community marched in President Obama's Inaugural Parade. 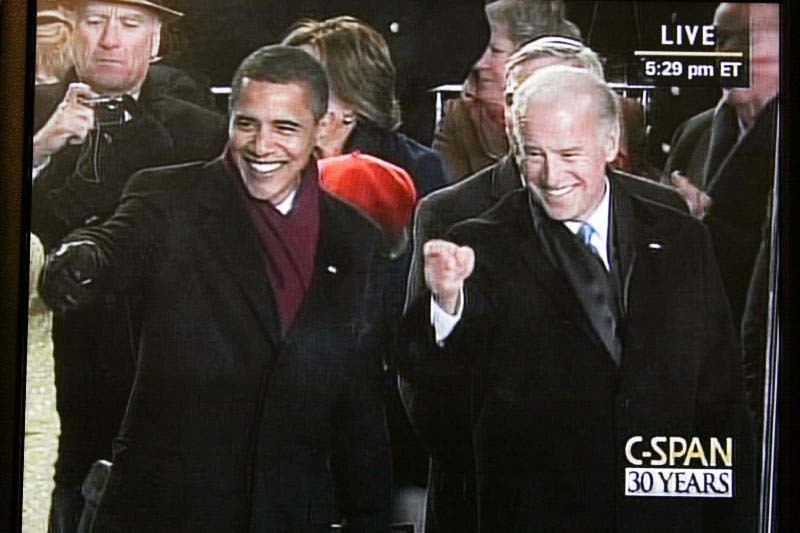 President-elect Barack Obama and Vice President-elect Joe Biden's Inaugural Committee officially extended an offer to the Peace Corps Community and AmeriCorps Alums to march in the 56th Inaugural Parade. Members of these service organizations joined representatives from across the country and our Armed Forces in the historic parade down Pennsylvania Avenue following President-elect Obama's swearing-in ceremony on the steps of the Capitol. The Peace Corps Community included members who served with the corps in the 1960s to the present. 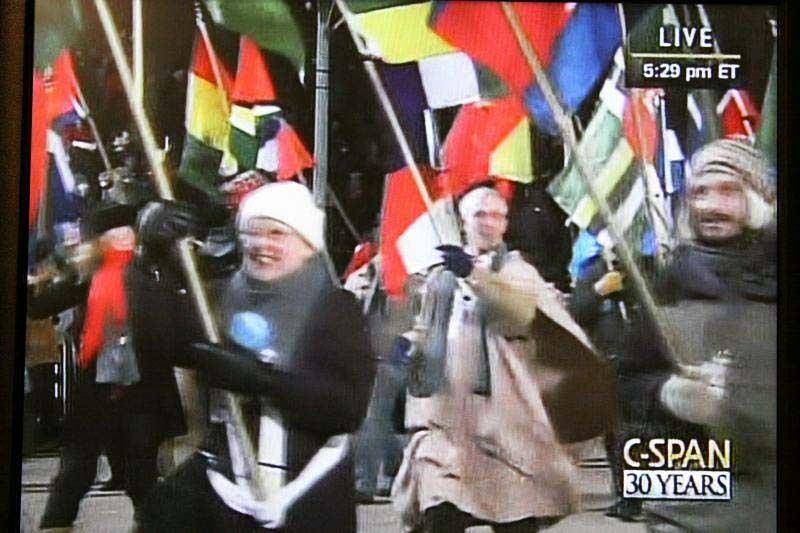 Marchers carried the flags of the countries that Peace Corps have served over the years. AmeriCorps Alums will include some of the millions of alumni of national service in this country since John F. Kennedy's call to service and the conception of VISTA (Volunteers in Service to America) in 1961. The Peace Corps Community included members who served with the corps in the 1960s to the present. Afghanistan Returned Peace Corps Volunteer Mary Craig represented the Peace Corps community in President Obama's Inaugural parade, Albania Returned Peace Corps Volunteer Sarah Bartfeld participated in the Inaugural Parade, Armenia Returned Peace Corps Volunteer William Dickinson represented the Peace Corps community in President Obama's Inaugural parade, Azerbaijan Returned Peace Corps Volunteer David Gottfried carried the flag of the Country of Service in President Obama's Inaugural parade, Bangladesh Returned Peace Corps Volunteer Gina Reynolds marched with the Peace Corps Community in the 2009 Inaugural Parade, Belize Returned Peace Corps Volunteer Mi Kim participated in the Inaugural Parade representing the Peace Corps community, Belize Returned Peace Corps Volunteer Phillip Stafford marched with the Peace Corps Community, Benin Returned Peace Corps Volunteer Jayne Booker participated in the Inaugural Parade, Benin Returned Peace Corps Volunteer Frances Iliff carried the flag of the Country of Service in President Obama's Inaugural parade, Benin Returned Peace Corps Volunteer Corey Taylor marched with the Peace Corps Community, Bolivia Returned Peace Corps Volunteer Elizabeth Gore carried the flag of the Country of Service in President Obama's Inaugural parade, Bolivia Returned Peace Corps Volunteer James Gore carried the flag of the Country of Service in President Obama's Inaugural parade, Bolivia Returned Peace Corps Volunteer Minor Huffman carried the flag of the Country of Service in President Obama's Inaugural parade, Bolivia Returned Peace Corps Volunteer Jeffrey Lovelace Jr participated in the Inaugural Parade representing the Peace Corps community. 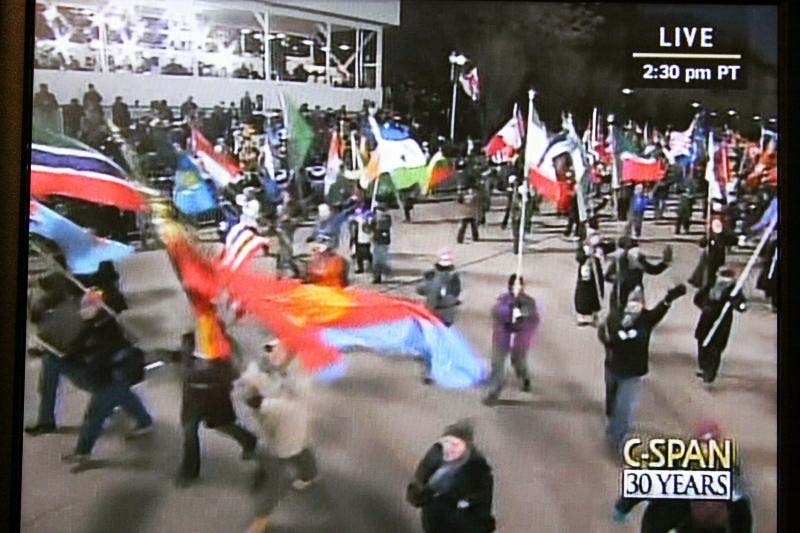 Marchers carried the flags of the countries that Peace Corps have served over the years. Bolivia Returned Peace Corps Volunteer Emily Nicholson marched with the Peace Corps Community in the 2009 Inaugural Parade, Bolivia Returned Peace Corps Volunteer John Nicholson marched with the Peace Corps Community in the 2009 Inaugural Parade, Botswana Returned Peace Corps Volunteer Sharon Freeman represented the Peace Corps community in President Obama's Inaugural parade, Botswana RPCV Bronwyn Mitchell participated in the Inaugural Parade representing the Peace Corps community, Brazil Returned Peace Corps Volunteer Lucille (Lucy) Mueller marched with the Peace Corps Community in the 2009 Inaugural Parade, Bulgaria RPCV Amy Jones participated in the Inaugural Parade representing the Peace Corps community, Burkina Faso Returned Peace Corps Volunteer Heidi Mccomb participated in the Inaugural Parade representing the Peace Corps community, Burkina Faso Returned Peace Corps Volunteer John Waite marched with the Peace Corps Community, Cameroon RPCV Amber Lantz participated in the Inaugural Parade representing the Peace Corps community, Cameroon RPCV Anne Shinn marched with the Peace Corps Community, Cameroon RPCV Ann Varghese marched with the Peace Corps Community, Cape Verde RPCV Amy Goh carried the flag of the Country of Service in President Obama's Inaugural parade, Central African Republic Returned Peace Corps Volunteer Jay Mashburn participated in the Inaugural Parade representing the Peace Corps community. 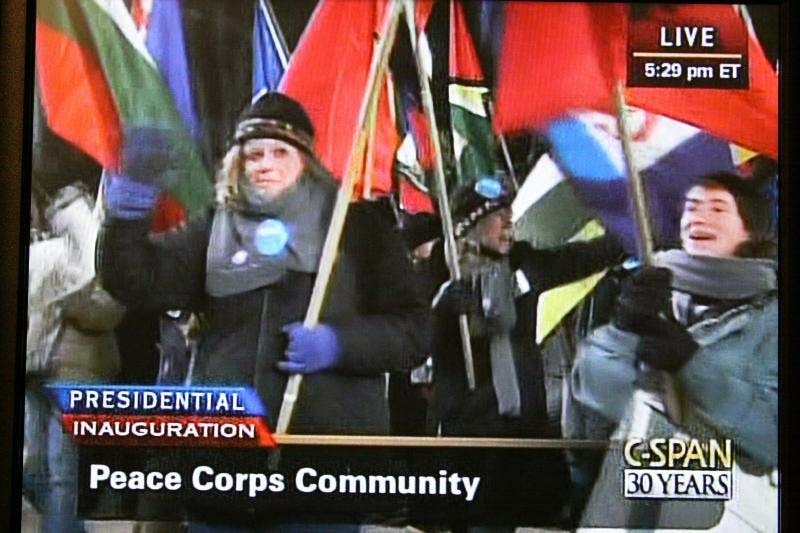 The Peace Corp's selection for a parade spot in 2009 -- its first acceptance in 12 years -- seems fitting in that President-elect Barack Obama has called for a Kennedy-like focus on national service. Chad Returned Peace Corps Volunteer John Riggan marched with the Peace Corps Community, Chile Returned Peace Corps Volunteer Jean Lujan participated in the Inaugural Parade representing the Peace Corps community, China Returned Peace Corps Volunteer Dylan Lange participated in the Inaugural Parade representing the Peace Corps community, Colombia Returned Peace Corps Volunteer Martin Acevedo participated in the Inaugural Parade, Colombia Returned Peace Corps Volunteer Joan Mckniff participated in the Inaugural Parade representing the Peace Corps community, Costa Rica Returned Peace Corps Volunteer Kelley Burns participated in the Inaugural Parade, Costa Rica Returned Peace Corps Volunteer Jayne Chandler represented the Peace Corps community in President Obama's Inaugural parade, Costa Rica Returned Peace Corps Volunteer Divine-Asia Planes marched with the Peace Corps Community in the 2009 Inaugural Parade, Cote D'Ivoire RPCV Amy Panoni marched with the Peace Corps Community in the 2009 Inaugural Parade, Dominica Returned Peace Corps Volunteer Michael Peter marched with the Peace Corps Community in the 2009 Inaugural Parade, Dominican Republic Returned Peace Corps Volunteer Tanya Gipson-Nahman carried the flag of the Country of Service in President Obama's Inaugural parade, Dominican Republic Returned Peace Corps Volunteer Laurian Mapp participated in the Inaugural Parade representing the Peace Corps community, East Timor Returned Peace Corps Volunteer Sarah Winnan marched with the Peace Corps Community, Ecuador RPCV Benjamin Bellows participated in the Inaugural Parade, Ecuador Returned Peace Corps Volunteer Ralph Blessing participated in the Inaugural Parade. 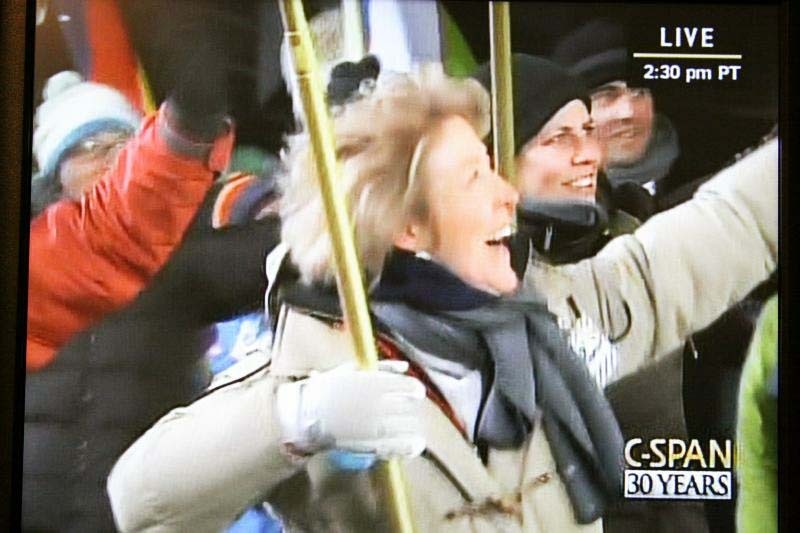 It was clear that Peace Corps - tuned to the values of service, cultural understanding and international engagement - struck a chord not only with the leaders in the viewing stand, but also with the crowds. Ecuador Returned Peace Corps Volunteer Ulysses Hudson carried the flag of the Country of Service in President Obama's Inaugural parade, Ecuador Returned Peace Corps Volunteer Kathleen Sciarini marched with the Peace Corps Community, El Salvador Returned Peace Corps Volunteer Jessica Benton Cooney participated in the Inaugural Parade, El Salvador Returned Peace Corps Volunteer Matthew Ladd participated in the Inaugural Parade representing the Peace Corps community, Eritrea Returned Peace Corps Volunteer Jennifer Riggan marched with the Peace Corps Community in the 2009 Inaugural Parade, Estonia Returned Peace Corps Volunteer Lisa Martin participated in the Inaugural Parade representing the Peace Corps community, Estonia RPCV Audrey Scott marched with the Peace Corps Community, Ethiopia Returned Peace Corps Volunteer Stephen Buff participated in the Inaugural Parade, Ethiopia Country Director Harris Wofford marched with the Peace Corps Community, Fiji RPCV Anne Baker participated in the Inaugural Parade, Fiji Returned Peace Corps Volunteer Murty Polavarapu marched with the Peace Corps Community in the 2009 Inaugural Parade, Gabon Returned Peace Corps Volunteer Cynthia Vinson marched with the Peace Corps Community, Gambia Returned Peace Corps Volunteer David Eric Burman participated in the Inaugural Parade, Gambia Returned Peace Corps Volunteer Erica Burman participated in the Inaugural Parade, Gambia Returned Peace Corps Volunteer Michael Sheppard marched with the Peace Corps Community. 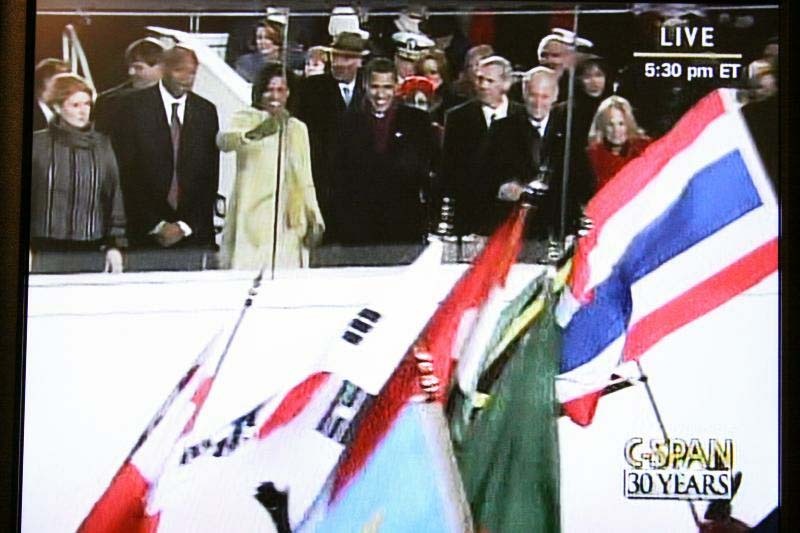 President Obama seemed to exchange glances and gestures with one of the leaders of our contingent, Harris Wofford, a former senator from Pennsylvania and a key player in the establishment of the Peace Corps. It was clear from President Obama�s reaction that these men shared a personal connection and a mutual respect for one another. Georgia RPCV Christina Jones participated in the Inaugural Parade representing the Peace Corps community, Ghana Returned Peace Corps Volunteer Tosha Bitho participated in the Inaugural Parade, Ghana RPCV Bea Tijerina marched with the Peace Corps Community, Grenada Returned Peace Corps Volunteer Karen Hertz carried the flag of the Country of Service in President Obama's Inaugural parade, Guatemala Returned Peace Corps Volunteer Erik Lang participated in the Inaugural Parade representing the Peace Corps community, Guatemala Returned Peace Corps Volunteer Joslin Phillibert marched with the Peace Corps Community in the 2009 Inaugural Parade, Guinea Returned Peace Corps Volunteer Deb Harris carried the flag of the Country of Service in President Obama's Inaugural parade, Guinea Returned Peace Corps Volunteer Michael Hutcheson carried the flag of the Country of Service in President Obama's Inaugural parade, Haiti Returned Peace Corps Volunteer Jennifer Maccormack participated in the Inaugural Parade representing the Peace Corps community, Haiti RPCV Bryan Schaaf marched with the Peace Corps Community, Honduras RPCV Brianna Bailey participated in the Inaugural Parade, Honduras Returned Peace Corps Volunteer Sarah Gale represented the Peace Corps community in President Obama's Inaugural parade, Honduras Returned Peace Corps Volunteer Jan Guifarro carried the flag of the Country of Service in President Obama's Inaugural parade, Honduras RPCV Catherine Reilly marched with the Peace Corps Community in the 2009 Inaugural Parade, Honduras Returned Peace Corps Volunteer Derek Sedlacek marched with the Peace Corps Community, Hungary Returned Peace Corps Volunteer Gilbert Swift marched with the Peace Corps Community, India Returned Peace Corps Volunteer Janet Greig carried the flag of the Country of Service in President Obama's Inaugural parade, Iran Returned Peace Corps Volunteer Jacqueline Spurlock marched with the Peace Corps Community, Ivory Coast RPCV Bonnie Gottlieb carried the flag of the Country of Service in President Obama's Inaugural parade, Jamaica Returned Peace Corps Volunteer Kelly Cullen represented the Peace Corps community in President Obama's Inaugural parade, Jamaica Returned Peace Corps Volunteer Jacqueline Patterson marched with the Peace Corps Community in the 2009 Inaugural Parade. 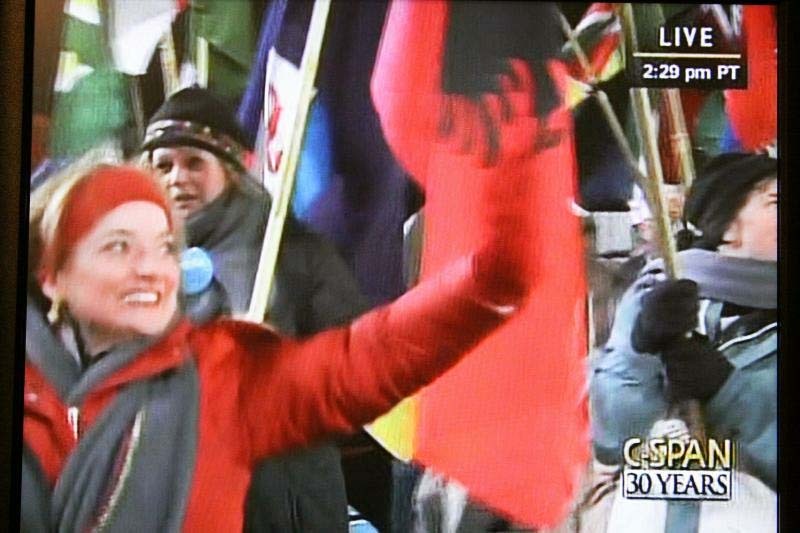 Watching footage of the parade, one is struck by the beauty of all those flags from all of those countries, representing all those volunteers and the concept of Peace Corps, the whole of whose service is much greater than the sum of its parts. 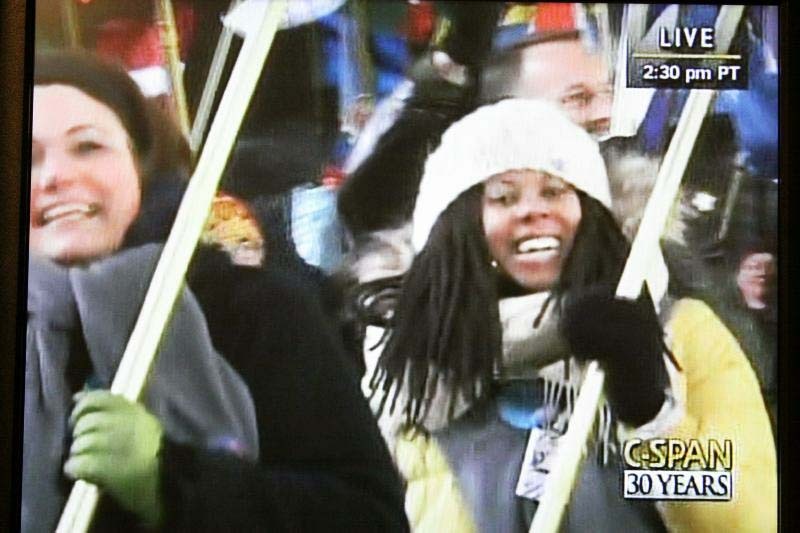 Jamaica RPCV Betty Pyle marched with the Peace Corps Community in the 2009 Inaugural Parade, Jamaica Returned Peace Corps Volunteer K. Richard Pyle marched with the Peace Corps Community in the 2009 Inaugural Parade, Jordan Returned Peace Corps Volunteer Rose Kyprianou participated in the Inaugural Parade representing the Peace Corps community, Kazakhstan RPCV Angela Davis represented the Peace Corps community in President Obama's Inaugural parade, Kazakhstan Returned Peace Corps Volunteer Leanne Dougherty represented the Peace Corps community in President Obama's Inaugural parade, Kazakhstan Returned Peace Corps Volunteer Katrina Erdahl represented the Peace Corps community in President Obama's Inaugural parade, Kenya Returned Peace Corps Volunteer Jennifer Monahan marched with the Peace Corps Community in the 2009 Inaugural Parade, Kiribati Returned Peace Corps Volunteer Patricia Brewer participated in the Inaugural Parade, Latvia Returned Peace Corps Volunteer Katherine Prentice marched with the Peace Corps Community in the 2009 Inaugural Parade, Lesotho RPCV Allison Pranger marched with the Peace Corps Community in the 2009 Inaugural Parade. 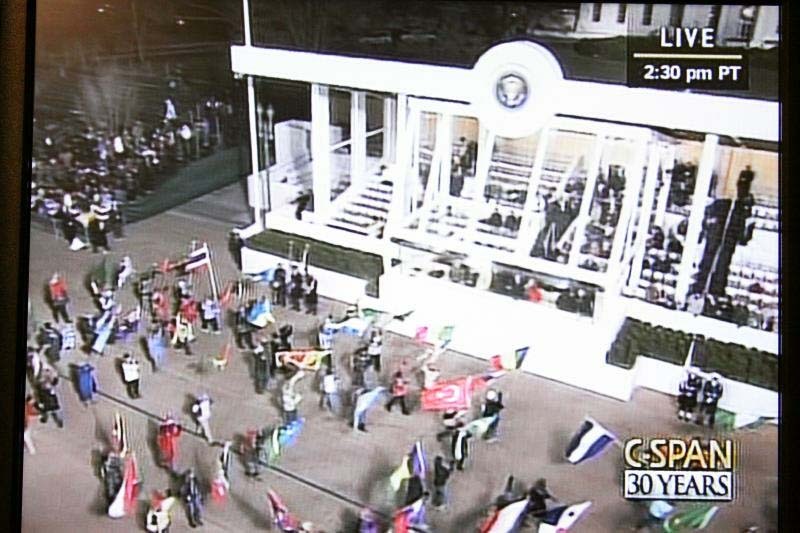 "Then there was the Presidential viewing stand. Dusk had descended. 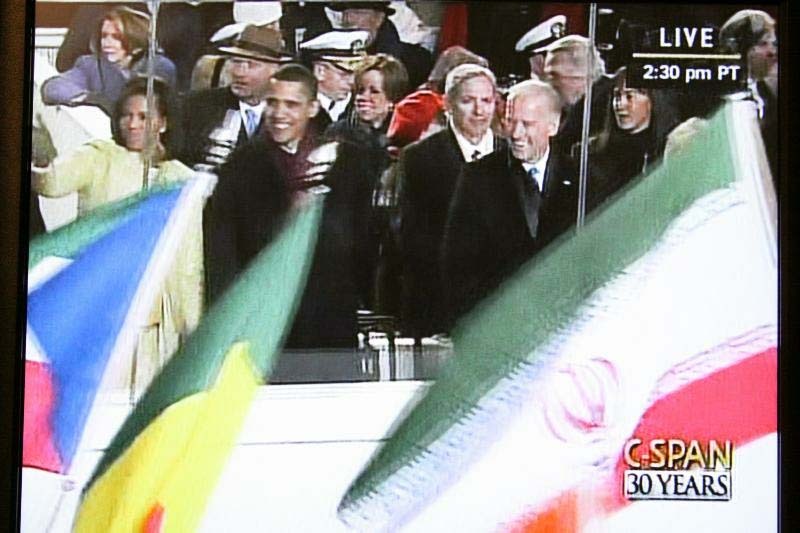 The Obamas and Bidens stood behind the bullet proof glass, lights shining down on them. They looked larger than life." 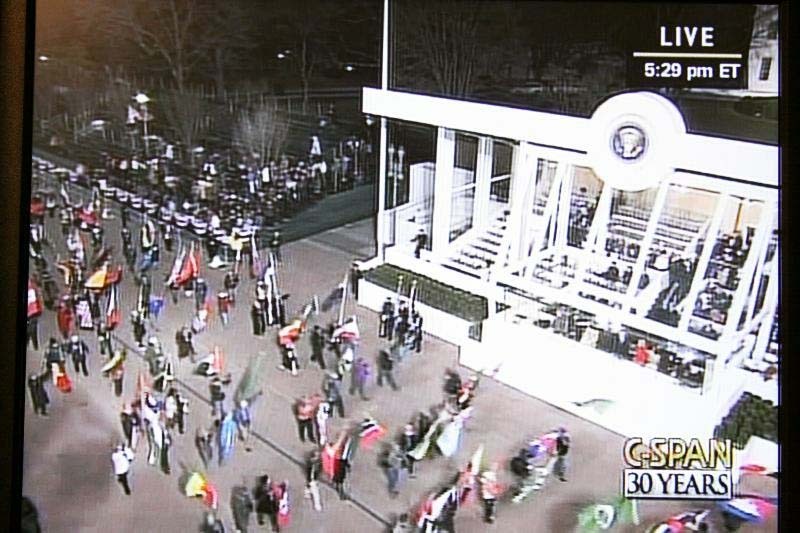 Liberia Returned Peace Corps Volunteer Rena Coughlin represented the Peace Corps community in President Obama's Inaugural parade, Liberia RPCV Angene Wilson marched with the Peace Corps Community, Liberia Returned Peace Corps Volunteer Jack Wilson marched with the Peace Corps Community, Libya RPCV Charles Beach participated in the Inaugural Parade, Lithuania RPCV Amy Balcius participated in the Inaugural Parade, Lithuania Returned Peace Corps Volunteer Heidi Jack carried the flag of the Country of Service in President Obama's Inaugural parade, Macedonia Returned Peace Corps Volunteer Kaitlin Mcdonough participated in the Inaugural Parade representing the Peace Corps community, Madagascar RPCV Aaron Christman represented the Peace Corps community in President Obama's Inaugural parade, Madagascar Returned Peace Corps Volunteer Jenny Christman represented the Peace Corps community in President Obama's Inaugural parade, Madagascar Returned Peace Corps Volunteer Matthew Erdman represented the Peace Corps community in President Obama's Inaugural parade, Madagascar Returned Peace Corps Volunteer Sarah Erdman represented the Peace Corps community in President Obama's Inaugural parade, Madagascar Returned Peace Corps Volunteer Kame Westerman marched with the Peace Corps Community, Malawi Returned Peace Corps Volunteer Jake Farnum represented the Peace Corps community in President Obama's Inaugural parade, Malawi Returned Peace Corps Volunteer Mary Kaluza participated in the Inaugural Parade representing the Peace Corps community, Malaysia RPCV Cleo Townsend marched with the Peace Corps Community. There was something deeply symbolic in every facet of this shared moment: the ethnic diversity, the generational diversity, the variety of backgrounds and professions. Mali RPCV Christopher Helmkamp carried the flag of the Country of Service in President Obama's Inaugural parade, Mali Returned Peace Corps Volunteer Mary Kay Jou participated in the Inaugural Parade representing the Peace Corps community, Mali Returned Peace Corps Volunteer Molly Mattessich participated in the Inaugural Parade representing the Peace Corps community, Marshall Islands Returned Peace Corps Volunteer Jean Deal represented the Peace Corps community in President Obama's Inaugural parade, Mauritania Returned Peace Corps Volunteer Jacqueline Waite marched with the Peace Corps Community, Micronesia Returned Peace Corps Volunteer Victoria Hammond carried the flag of the Country of Service in President Obama's Inaugural parade, Micronesia Returned Peace Corps Volunteer Kate Melloy Goettel participated in the Inaugural Parade representing the Peace Corps community, Moldova Returned Peace Corps Volunteer Erin Penniston marched with the Peace Corps Community in the 2009 Inaugural Parade, Mongolia Returned Peace Corps Volunteer Sunaree Marshall participated in the Inaugural Parade representing the Peace Corps community, Mongolia Returned Peace Corps Volunteer Dara Ross marched with the Peace Corps Community, Morocco Returned Peace Corps Volunteer Michael Kendellen participated in the Inaugural Parade representing the Peace Corps community, Morocco RPCV Bart Pogue marched with the Peace Corps Community in the 2009 Inaugural Parade. "The day�s brisk wind animated their vibrant colors. That sea of 139 flags, signifying the countries where Peace Corps has served since its founding in 1961, spoke of America�s sense of service to the world around us," wrote Audrey Scott. Mozambique Returned Peace Corps Volunteer Laura Belazis participated in the Inaugural Parade, Mozambique Returned Peace Corps Volunteer Elizabeth Kane participated in the Inaugural Parade representing the Peace Corps community, Namibia Returned Peace Corps Volunteer Erfan Mojaddam participated in the Inaugural Parade representing the Peace Corps community, Nepal Returned Peace Corps Volunteer Rajeev Goyal carried the flag of the Country of Service in President Obama's Inaugural parade, Nepal Returned Peace Corps Volunteer Sharon Stash marched with the Peace Corps Community, Nepal Returned Peace Corps Volunteer Judy Steiger marched with the Peace Corps Community, Nicaragua Returned Peace Corps Volunteer Sarah Fierce represented the Peace Corps community in President Obama's Inaugural parade, Nicaragua RPCV Ada Sheng marched with the Peace Corps Community, Niger Returned Peace Corps Volunteer Joanne Pascale marched with the Peace Corps Community in the 2009 Inaugural Parade, Niger Returned Peace Corps Volunteer Kristen Patterson marched with the Peace Corps Community in the 2009 Inaugural Parade, Oman Returned Peace Corps Volunteer James Reigle marched with the Peace Corps Community in the 2009 Inaugural Parade, Pakistan RPCV Barbara-Jean Janes carried the flag of the Country of Service in President Obama's Inaugural parade, Palau Returned Peace Corps Volunteer Quincy Stewart marched with the Peace Corps Community, Panama Returned Peace Corps Volunteer Michael Gaffney represented the Peace Corps community in President Obama's Inaugural parade. 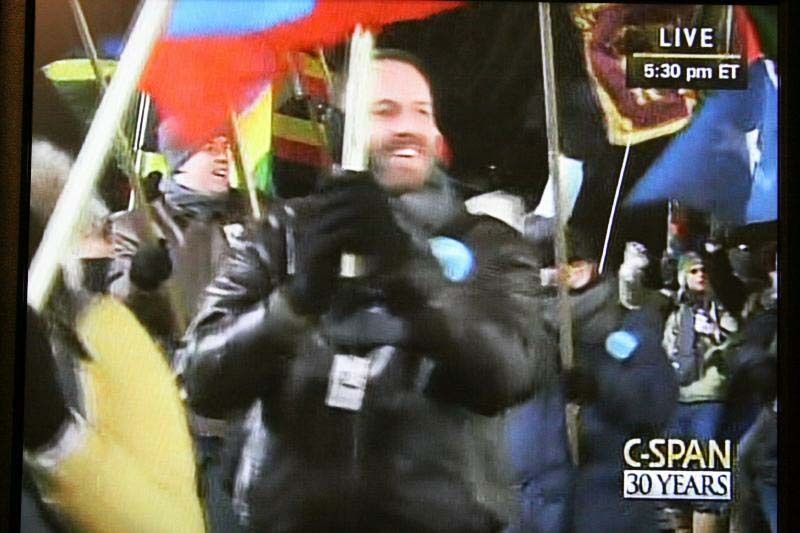 "The flags stood for the tens of thousands of American Peace Corps volunteers who served across the world, from the tropical heat of Micronesia to the frigid cold of Estonia. Their movement spoke of a spirit of service that still lives - in returned volunteers, in those currently serving and in the ideals of those who will someday serve" wrote Audrey Scott. Papua New Guinea Returned Peace Corps Volunteer Nancy Chorpenning represented the Peace Corps community in President Obama's Inaugural parade, Paraguay Returned Peace Corps Volunteer Katie Sobczak marched with the Peace Corps Community, Peru RPCV Bruce Anderson participated in the Inaugural Parade, Peru Returned Peace Corps Volunteer Victor Ciardello represented the Peace Corps community in President Obama's Inaugural parade, Philippines Returned Peace Corps Volunteer Hannah Fairbank represented the Peace Corps community in President Obama's Inaugural parade, Philippines Returned Peace Corps Volunteer Lindsey Johnson carried the flag of the Country of Service in President Obama's Inaugural parade, Poland Returned Peace Corps Volunteer Helen Hermus carried the flag of the Country of Service in President Obama's Inaugural parade, Republic of Korea RPCV Barbara Bixby participated in the Inaugural Parade, Romania Returned Peace Corps Volunteer Rosemary Johnson carried the flag of the Country of Service in President Obama's Inaugural parade, Romania RPCV Caitlin Kurylo participated in the Inaugural Parade representing the Peace Corps community, Romania Returned Peace Corps Volunteer Stephanie Paul marched with the Peace Corps Community in the 2009 Inaugural Parade, Russian Federation Returned Peace Corps Volunteer Suzette Agans participated in the Inaugural Parade, Russian Federation Returned Peace Corps Volunteer Kendra Gray carried the flag of the Country of Service in President Obama's Inaugural parade, Samoa Returned Peace Corps Volunteer Emily Larkin participated in the Inaugural Parade representing the Peace Corps community, Samoa RPCV Amanda Roesch marched with the Peace Corps Community. Senegal Returned Peace Corps Volunteer Sharon Cooke represented the Peace Corps community in President Obama's Inaugural parade, Senegal Returned Peace Corps Volunteer Geri Critchley represented the Peace Corps community in President Obama's Inaugural parade, Sierra Leone RPCV Anne Dordal represented the Peace Corps community in President Obama's Inaugural parade, Sierra Leone Returned Peace Corps Volunteer David Magnani participated in the Inaugural Parade representing the Peace Corps community, Sierra Leone Returned Peace Corps Volunteer Marian Murrah marched with the Peace Corps Community in the 2009 Inaugural Parade, Sierra Leone Returned Peace Corps Volunteer David O'neill marched with the Peace Corps Community in the 2009 Inaugural Parade, Slovakia Returned Peace Corps Volunteer Jennifer Uhler marched with the Peace Corps Community, South Africa Returned Peace Corps Volunteer Jessica Lampron participated in the Inaugural Parade representing the Peace Corps community, Sri Lanka Returned Peace Corps Volunteer Elizabeth Fuhrman represented the Peace Corps community in President Obama's Inaugural parade, Swaziland Returned Peace Corps Volunteer Jay Lubin participated in the Inaugural Parade representing the Peace Corps community, Taiwan Returned Peace Corps Volunteer Pei-Zei Lin participated in the Inaugural Parade representing the Peace Corps community, Thailand Returned Peace Corps Volunteer Paulo Couto represented the Peace Corps community in President Obama's Inaugural parade, Thailand Returned Peace Corps Volunteer Keri Guilford carried the flag of the Country of Service in President Obama's Inaugural parade, Thailand Returned Peace Corps Volunteer John Michael Hall carried the flag of the Country of Service in President Obama's Inaugural parade. "As for the returned volunteers, we waved excitedly like children and couldn�t help but wear smiles, even if they were a bit tighter from the cold." Thailand Returned Peace Corps Volunteer Natalie Hall carried the flag of the Country of Service in President Obama's Inaugural parade, Thailand Returned Peace Corps Volunteer Mitchell Kent participated in the Inaugural Parade representing the Peace Corps community, Thailand Returned Peace Corps Volunteer Helen Lowman participated in the Inaugural Parade representing the Peace Corps community, Thailand Returned Peace Corps Volunteer Kevin Quigley marched with the Peace Corps Community in the 2009 Inaugural Parade, Thailand Returned Peace Corps Volunteer Kelley Thompson marched with the Peace Corps Community, Togo RPCV Anne Kaiser participated in the Inaugural Parade representing the Peace Corps community, Togo Returned Peace Corps Volunteer Margaret Murphy marched with the Peace Corps Community in the 2009 Inaugural Parade, Tonga Returned Peace Corps Volunteer Michael Thomas marched with the Peace Corps Community, Tunisia Returned Peace Corps Volunteer Josephine Olsen marched with the Peace Corps Community in the 2009 Inaugural Parade, Turkey Returned Peace Corps Volunteer Muriel Ring marched with the Peace Corps Community, Turkmenistan Returned Peace Corps Volunteer Stacy Ragan marched with the Peace Corps Community in the 2009 Inaugural Parade, Uganda Returned Peace Corps Volunteer Priscilla Goldfarb carried the flag of the Country of Service in President Obama's Inaugural parade, Ukraine Returned Peace Corps Volunteer Raisa Gutierrez carried the flag of the Country of Service in President Obama's Inaugural parade, Ukraine RPCV Beth Macrae participated in the Inaugural Parade representing the Peace Corps community, Ukraine Returned Peace Corps Volunteer Fredric Stokes marched with the Peace Corps Community, Ukraine Returned Peace Corps Volunteer Raejean Stokes marched with the Peace Corps Community, Ukraine Returned Peace Corps Volunteer Jean Zachariasiewicz marched with the Peace Corps Community. "I was honored and humbled, both to represent the Peace Corps and to take part in this historic day." 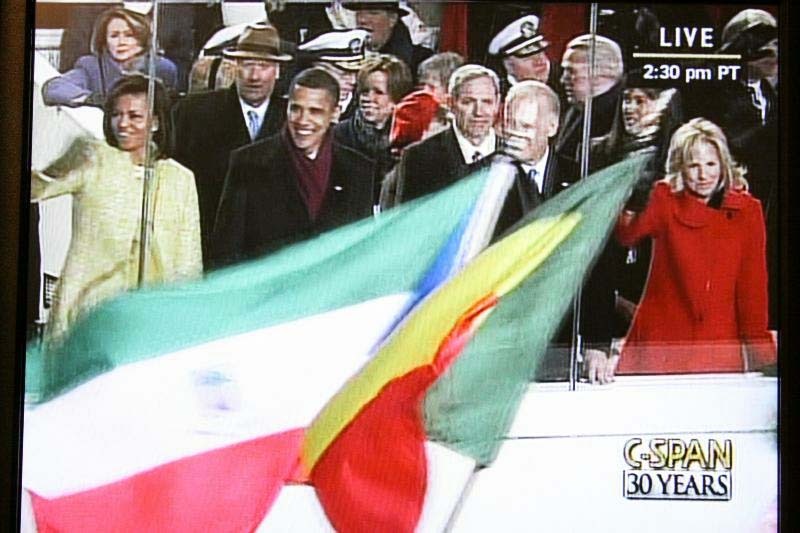 Returned Peace Corps Volunteer John Hayes carried the flag of the Country of Service in President Obama's Inaugural parade, Uruguay RPCV Alan Richey marched with the Peace Corps Community in the 2009 Inaugural Parade, Uzbekistan Returned Peace Corps Volunteer Kimberly Maine participated in the Inaugural Parade representing the Peace Corps community, Vanuatu Returned Peace Corps Volunteer Melissa Gang carried the flag of the Country of Service in President Obama's Inaugural parade, Yemen Returned Peace Corps Volunteer Tania Mazza participated in the Inaugural Parade representing the Peace Corps community, Zaire Returned Peace Corps Volunteer Joseph Dicesare represented the Peace Corps community in President Obama's Inaugural parade, Zaire RPCV Angela Martin participated in the Inaugural Parade representing the Peace Corps community, Zambia Returned Peace Corps Volunteer Jarret Cassaniti represented the Peace Corps community in President Obama's Inaugural parade, Zambia Returned Peace Corps Volunteer Joseph Ford represented the Peace Corps community in President Obama's Inaugural parade, Zimbabwe Returned Peace Corps Volunteer Julie Lee participated in the Inaugural Parade representing the Peace Corps community, Zimbabwe Returned Peace Corps Volunteer Lica Tomizuka marched with the Peace Corps Community, Returned Peace Corps Volunteer Patricia Calamari participated in the Inaugural Parade, Returned Peace Corps Volunteer Randall Johnston participated in the Inaugural Parade representing the Peace Corps community. Didn't see anyone representing Somalia. An oversight or intentional? Very regrettable in either instance. 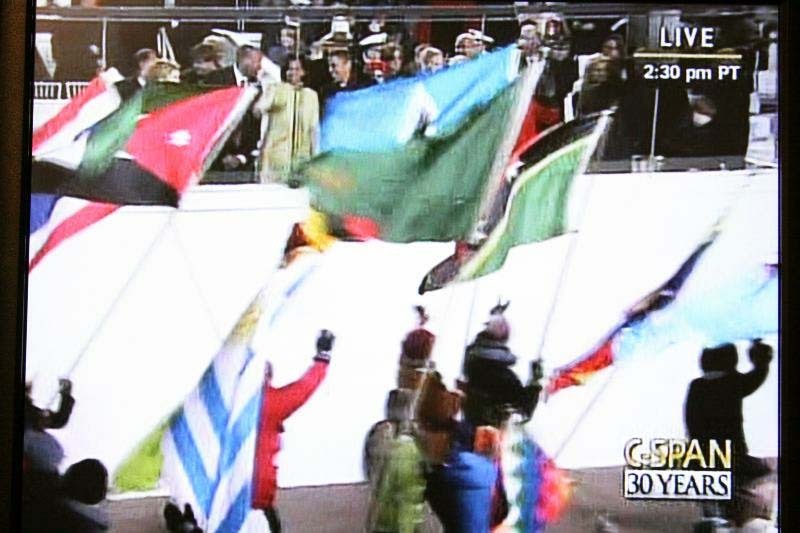 "The flags of all Peace Corps countries were in the parade. But there was a lottery for marchers, so there wasn't necessarily a marcher from every country. Some countries had several marchers...some had none." 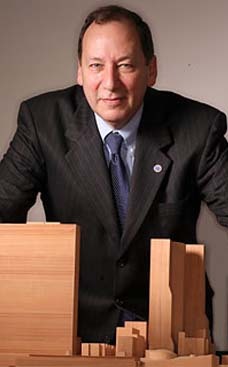 Read more on the NPCA Web Site.